The new hybrid Suzuki Swift is different from the mild hybrid SHVS variant that Maruti is expected to unveil in India. Ahead of its official unveil in India, Suzuki has rolled out a fully hybrid variant of the upcoming Swift hatchback. Unveiled globally, the new Suzuki Swift has been rolled out in Hybrid SG and Hybrid SL variants in Japan. Both these variants combine the standard 91bhp 1.2-litre petrol engine to a 14bhp Motor Generator Unit (MGU) combined with 5-speed Auto Gear Shift (AGS) transmission. The biggest advantage of this mechanism is that while moving at a constant speed or crawling along in city traffic, the combustion engine is automatically switched off and the vehicle is switched to all-electric mode to drastically improve overall fuel economy. 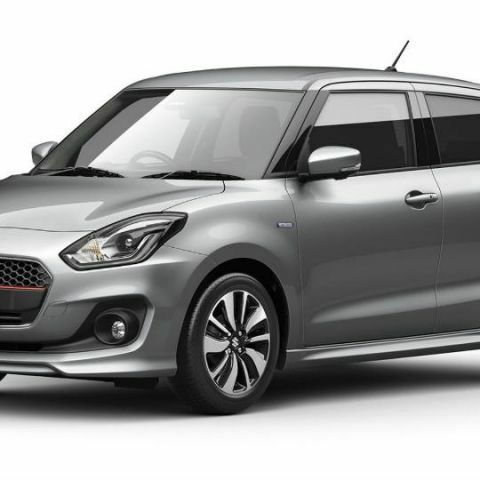 The new Suzuki Swift is based on the new HEARTECT platform, and the chassis' overall weight of below 1,000 kilograms means that the vehicle is lightweight and the claimed fuel efficiency is at a commendable 32kmpl. Along with the hybrid powertrain, the 2017 Suzuki Swift Hybrid SL comes with paddle shifters to improve the driving experience. You also get Suzuki's Dual Sensor Brake Support (DSBS), which uses a monocular camera along with a laser sensor to automate collision avoidance and detect obstacles and pedestrians. Other standard safety features in the Suzuki Swift Hybrid include front and side SRS airbags, making this car incredibly feature-loaded and safe as well. The new generation Suzuki Swift is expected to premiere at the 2018 Auto Expo, although based on the present GST tax regime's heavy rates on hybrid vehicles, it seems a little unlikely that the Swift Hybrid SG and SL would be brought to India. The cars would end up being significantly more expensive than the non-hybrid counterparts, although Maruti may choose to use the Swift to carve out a niche for itself in a hybrid hatchback segment - a novel segment in the Indian auto segment.